Thai Lagoon is a family run business in Bedford, UK, offering delicious traditional Thai dishes cooked by an expert Thai chef, with competitive prices and a friendly atmosphere. 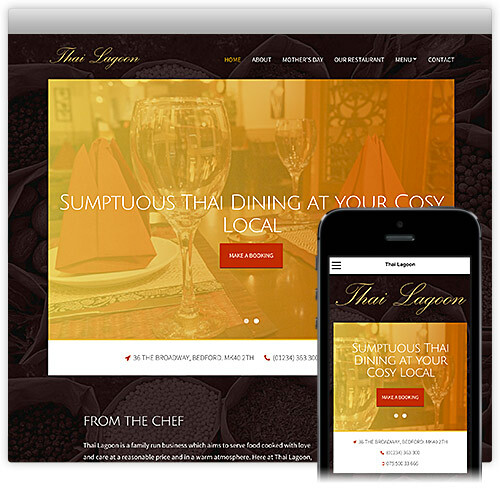 The new owners of Thai Lagoon took over the business, only to fall into a trap that many new business owners fall into – the previous web designer refused to honour the agreements made with the previous business owner, and saw this as an opportunity to make more money. After being suddenly left without a web presence, we created a simple holding page with all the crucial contact details and takeaway menu, and proceeded to quickly build a new website for Thai Lagoon. Mobile compatible, all our usual features! Copyright Adrian Halliday 2013. All Rights Reserved.